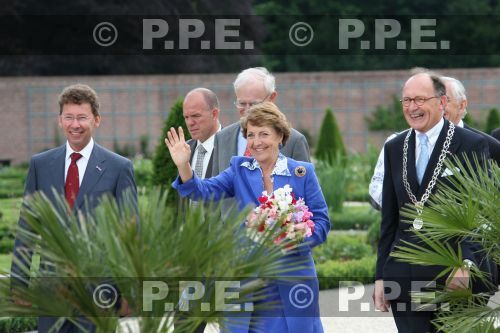 On Saturday morning princess Margriet did not have to travel far to her first official activity: she visited the neighbouring palace Het Loo in Apeldoorn. Here the princess attended the opening of the new terrace and the restaured ‘historical viewpoint’ in the garden of the palace. The opening also marked the 25th anniversary of palace Het Loo as a museum. Princess Margriet, her husband Pieter van Vollenhoven and their sons were the last royals to live in the palace. When it was decided the palace would be a museum the princess and her family moved to a modern bungalow on the royal domains. In 2003 the remains of the terraces and waterpipes were found and now in 2009 the garden is exactly in the original state, as it was in the times of stadholder Willem III and his wife princess Mary. The restauration took almost six months to complete. In the evening princess Margriet visited Arnhem where she attended a performance ‘End of Season’ by ‘Introdans’, a modern dancegroup. With this performance the group ended this years season. HRH is a patron of the dance group. Click here to visit the website of the palace. Tagged Anniversary, Het Loo Palace, Museum, Palaces, Patronage, Princess Margriet of the Netherlands.